It's a good idea to leave the dungeon once a party's adventuring day is done. Exhausted after searching empty rooms, fighting monsters, avoiding traps, and arguing over loot, it makes sense to head for the exit. After all, the nearby town has at least one inn, and inns have strong ale, female companionship, and comfortable beds! Much better than the cold stone of a hellish underworld. Nevertheless, ambitious and over-eager adventurers may decide to take an extended rest (over an hour) in the dungeon. For such an intrepid adventuring party who doesn't have the good sense to get out of the dungeon, roll a d6. 1. Night clowns... murderous, makeup smeared, rainbow wigged, machete wielding night clowns. 2. Someone in the party (roll randomly to see who) has gone missing. 3. At some point, slavers quietly sneak into the PCs' camp, attempting to subdue them. 4. The PCs activate a trap. 5. The PCs are visited by a beautiful young woman [2 in 6 chance she's a succubus]. 6. Vines grow at an alarming rate [2 in 6 chance of sentient plant-life tries to murder the PCs]. 7. Radiation leak! Every PC has a 2 in 6 chance of developing a mutation. 8. One of the PCs (randomly roll to see who) is possessed by some kind of dark force. 9. One of the PCs (randomly roll to see who) joins the legion of undead that roam this abysmal underworld. 10. One of the PCs (randomly roll to see who) has terrible dreams of drinking blood from the teat of a witch, worshiping a goat-like demon lord, and writing their name in a book bound in blackened flesh! That PC is most definitely cursed upon awaking. 11. One of the PCs awake to be half-digested by some kind of slime or jelly. 12. One of the party's magic items is missing. Whoever is missing the magic item has also been marked by a wizard. 13. The PCs suffer through horrendous spectral manifestations and gain no benefit from their fitful "rest." 14. The PCs are assaulted by some nameless, shadowy abomination, yet somehow manage to stumble their way through the darkness, finding the way out. 15. The PCs inadvertently discover a new secret passage. 16. Scheming! The PCs overhear plans being discussed within earshot. 17. The entire party has been kidnapped by... 1) dark elves, 2) demonic humanoids, 3) skeletal servants of a mad Necromancer, 4) goblinoid creatures. 18. One of the PCs (randomly roll) is petrified, turned to stone by someone or something in the dungeon. 19. Human cultists capture one of the PCs (randomly roll to see who) in order to be sacrificed to their malevolent deity. 20. A mystical gateway opens about 10' from where the PCs are resting. It leads to... 1) another plane, 2) another point in time, 3) another area of the dungeon, 4) utter and complete annihilation! 28. Taken prisoner! PCs wake up to find themselves locked in cells. No one around to ask who imprisoned them. This table was influenced by similar random tables found on the internet, such as this. I think it would be suitable for any O5R fantasy RPG. 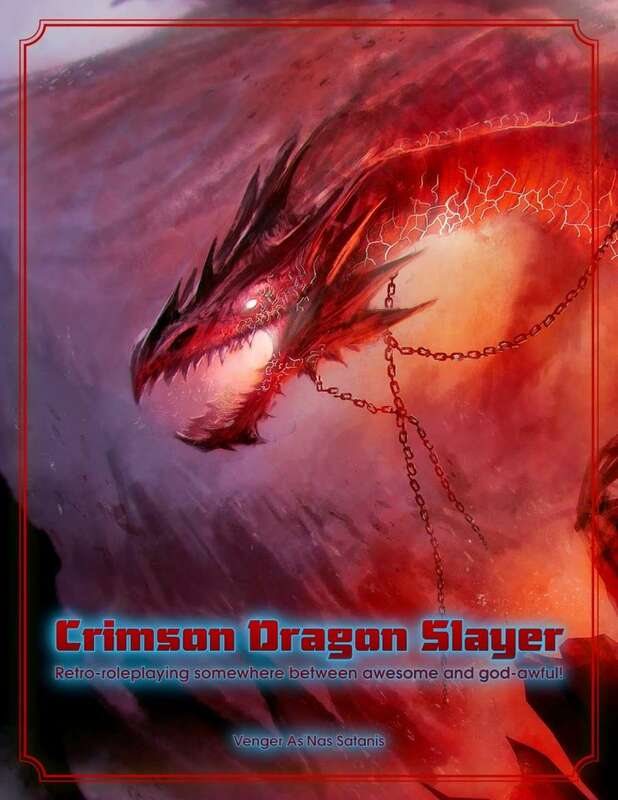 Crimson Dragon Slayer comes readily to mind! Thanks for reading and feel free to share this with others. If you use it in your game, let me know the result!